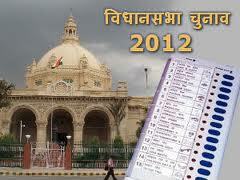 Uttar Pradesh(UP) Assembly election's Polling for the third phase on 56 seats in 10 districts begins under clear sky which decides the fate of three cabinet minister, a minister of state, 29 sitting MLAs and 14 former ministers. More than 1.75 crore voters are expected to cast their votes to seal the fate of 1018 candidates in the polling to be held in CSM Nagar, Sultanpur, Kaushambi, Allahabad, Jaunpur, Chandauli, Varanasi, Sant Ravidas Nagar, Mirzapur and Sonbhadra amidst tight security. Stakes are high for ruling BSP, Congress, SP and the BJP in the no holds barred fight for the 403 assembly seats. In this phase, at least 121 candidates with criminal background and as many as 48 'crorepatis' are in the fray. The third phase would seal the fate of cabinet ministers Indrajit Saroj - Manjhanpur, Nand Gopal Gupta alias Nandi - Allahabad South and Dharmaraj Nishad - Shahganj and minister of state Vinod Singh - Lambhua, besides 29 MLAs and 14 former ministers. In the 2007 assembly elections, the third phase covered 52 seats, of which BSP won 31, SP 11, BJP 6, Congress 3 and independent one.